Dharamsala over looks the plains and is surrounded by dense pine trees and Deodar forests. A nearby snowline with numerous streams and cool healthy atmosphere makes the surroundings very attractive. Dharamsala is a busy bazaar town and has established itself as the travellers base camp, who come to explore the nearby mountains. The Kotwali Bazaar provides the entire colour and characteristic of a small town, which is mixed with the simple life style. Kangra Art Museum : This treasure trove of the Kangra valley's arts, crafts, and rich past, displays artifacts that date back to the 5th century. The museum also includes a gallery of Kangra's famous miniature paintings and a representative collection of sculptures, pottery, and anthropological items. War Memorial : Set amidst the pine groves is a war memorial, built on the entry point of the to Dharamsala to commemorate the post independence war heroes of Himachal Pradesh. A web of narrow paths and landscaped lawns lead towards this monument. Mcleod Ganj : A number of residential buildings, restaurants, antique and curio shops, together with famous Tibetan institutions have lent importance to McLeod Ganj. The Budha temple is situated opposite to the present abode of His Holiness, the Dalai Lama and is worth a visit. 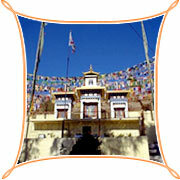 The Tibetan Institute of performing Arts(TIPA) is 1km. walk from McLeod Ganj and preserves a number of musical dance and theatrical traditions of Tibet. There is also a Tibetan handicraft centre situated at McLeod Ganj and a Sunday market is organized at about 10 minutes walk from here. Chamunda Devi Temple : Not far from Dharamsala is the famous temple of Chamunda Devi. It is an enchanting spot with glorious views of the mountains, the Baner Khud, Pathiar and Lahla forests. 15-km from Dharamshala a tiny village of Dadh on Palampur road is the famous temple dedicated to Goddess Chamunda Devi. Jwalamukhi Temple : Dedicated to the "Goddess Of Light", the temple is one of the most popular Hindu temples in northern India. There is no idol of any kind the flame is considered as a manifestation of the goddess. An eternally burning and shining blue flame emanates from the rock sanctum and is fed by the priests with the offerings of devotees. St.John's Church : The church of St. John's in the wilderness lies on a motorable road between McLeod Ganj and Forsythe Ganj 8kms. from Lower Dharamshala. It has a monument of Lord Elgin, one of the Viceroys of India, who died in Dharamshala and was buried here in 1863. Dharamsala's accommodation options include HPTDC's hotels, private hotels, guest houses, PWD and Forest rest houses, which are located in and around the place and are available at resonable prices. 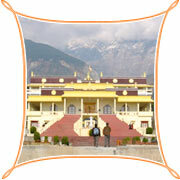 Dharamsala offers mainly the handicraft items, which are manufactured by the local artisans. The Kotwali Bazaar is one of the main shopping areas in the town. The main attraction of the town is Tibetan carpets. These carpets are delicately woven and are decorated with vivid colours. The Motifs on these carpets are either inspired from nature or from the monuments or carry a description of some folk story of the Tibetan cultural heritage. Over all, these carpets carry a totally different style and attraction from their counterparts in Kashmir or the Persian carpets. Further the local handicrafts are also available in the market. Tibetan Textile can be purchased from the office of Tibetan handicrafts. One can always bargain items like the traditional hat, the Chubas, the traditional wear for the Tibetan women, bags, trousers etc. As Dharamsala is located in the Himalayas, the climate is very pleasant during the summers but in winters the cold is very bad. Temperature can drop below the freezing point during the winters and heavy woollen clothes are required. During the summers the weather is mild and light woolens and cottons are recommended. The best time to visit the place is during the summers when the cold has shed its biting teeth and there is plenty of Sunshine. But avoid coming here during the monsoon months, as there is a danger of landslides. Air : Dharamsala can be approached by air from Delhi and the nearest Airport is at Gaggla, just 13-km away from the town. Rail : Pathankot is 85-km and is the nearest railhead for Dharamsala. Trains from all over the country make a stop over at Pathankot and from here it is a three-hour journey to Dharamsala. Road : From Manali too bus services are available to this place. One can drive from Delhi via Chandigarh , Kiratpur, Bilaspur and it's an 8-hours journey. From Delhi and Shimla , luxury buses ply to Dharamsala.